CAPE CANAVERAL AIR FORCE STATION, FL – Less than two weeks after a still mysterious launch pad explosion utterly destroyed a SpaceX Falcon 9 rocket during testing on Sept. 1, the bold and seemingly undaunted firm is already setting its sights on a ‘Return to Flight’ launch as early as November of this year, SpaceX President Gwynne Shotwell said Tuesday. “We’re anticipating getting back to flight, being down for about three months, so getting back to flight in November, the November timeframe,” Shotwell announced on Sept. 13, during a panel discussion at the World Satellite Business Week Conference being held in Paris, France. The catastrophic Sept. 1 launch pad explosion took place without warning at SpaceX’s Space Launch Complex-40 launch facility at approximately 9:07 a.m. EDT on Cape Canaveral Air Force Station, Fl during a routine fueling test. Both the $60 million SpaceX rocket and the $200 million AMOS-6 Israeli commercial communications satellite payload were completely destroyed in a massive fireball that erupted suddenly during a routine and planned pre-launch fueling and engine ignition test at pad 40 on Sept. 1. However, SpaceX is still seeking to determine the root cause of the catastrophe, which must be fully determined, corrected and rectified before any new Falcon 9 launches can actually occur. Indeed nailing down the root cause has thus far confounded SpaceX investigators and was labeled as the “most difficult and complex failure” in its history said SpaceX CEO and Founder Elon Musk in a series of update tweets on Sept. 9. He also sought the public’s help in ascertaining the elusive cause via any audio/video recordings. The rocket failure originated somewhere in the upper stage near the liquid oxygen (LOX) tank during fueling test operations at the launch pad, for what is known as a hot fire engine ignition test of all nine first stage Merlin 1D engines, said Musk. Engineers were in the final stages of loading the liquid oxygen (LOX) and RP-1 kerosene propellants that power the Falcon 9 first stage for the static fire test which is a full launch dress rehearsal. The anomaly took place about 8 minutes before the planned engine hot fire ignition. Shotwell also stated that the launch would occur from SpaceX’s other Florida Space Coast launch pad – namely the former Space Shuttle Launch Complex 39A on the Kennedy Space Center. 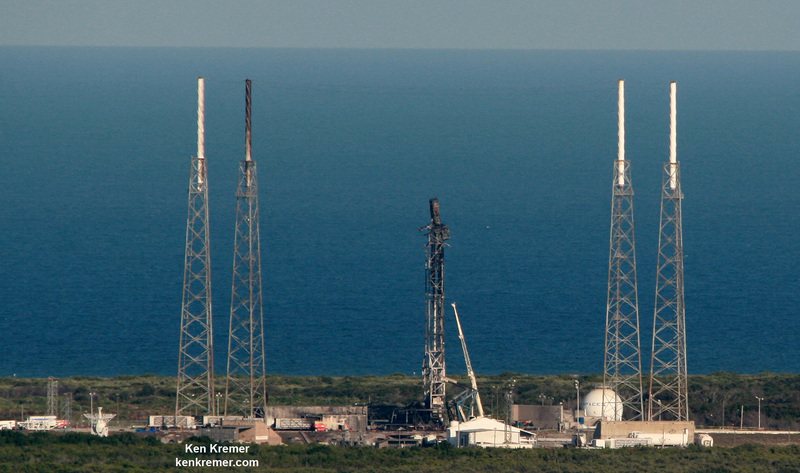 SpaceX also operates a third launch pad at Vandenberg Air Force Base in California. “We would launch from the East Coast on Pad 39A in the November timeframe. And then Vandenberg would be available … for our other assorted customers,” Shotwell stated. SpaceX has signed a long term lease with NASA to use Pad 39A. Shotwell did not say which payload would be the first to launch. The incident took place less than two days before the scheduled Falcon 9 launch of AMOS-6 on Sept. 3 from pad 40. The Sept. 1 calamity disaster also counts as the second time a Falcon 9 has exploded in 15 months and will call into question the rocket’s reliability. The first failure involved a catastrophic mid air explosion about two and a half minutes after liftoff, during the Dragon CRS-9 cargo resupply launch for NASA to the International Space Station on June 28, 2015 – and witnessed by this author. 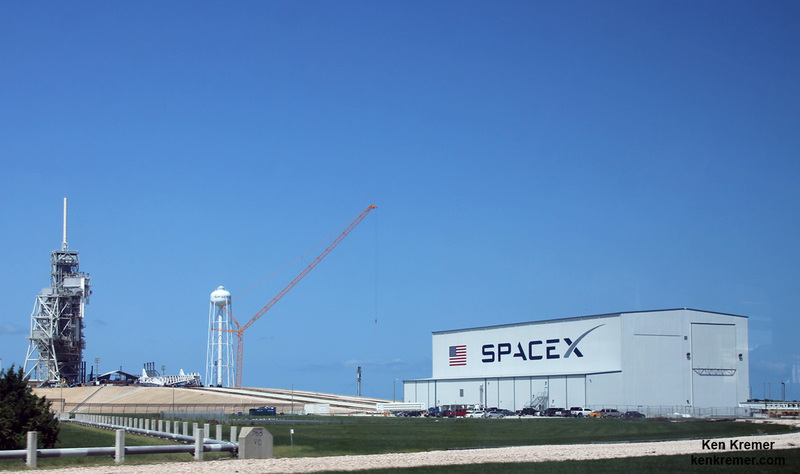 While launching from pad 40, SpaceX has simultaneously been renovating and refurbishing NASA’s former shuttle launch at Complex 39A – from which the firm hopes to launch the new Falcon Heavy booster as well as human rated launches of the Falcon 9 with the Crew Dragon to the ISS. And now according to Shotwell, SpaceX is expanding the scope of operations at pad 39A and intends to use it for commercial Falcon 9 launches as well – while they work to complete repairs to pad 40 which suffered significant damage, as I witnessed and just reported here. Ongoing work at Pad 39A was clearly visible to this author and other media this past week during NASA’s OSIRIS-REx launch campaign. SpaceX will have to finish the pad 39A upgrades soon in order to have any hopes of achieving a November return to flight launch date, and a lot of work remains to be done. For example the shuttle era Rotating Service Structure (RSS) is still standing. The timing for its demolishment has not been announced, according to a source. Prior to launching from 39A, SpaceX would presumably roll out a Falcon 9 rocket to conduct fit checks and conduct a full launch dress rehearsal and first stage static hot fire engine test to confirm that all the newly installed equipment, gear and fueling lines, pumps, etc. are fully functional, operational and safe. The rocket disaster was coincidentally captured as it unfolded in stunning detail in a spectacular up close video recorded by my space journalist colleague at USLaunchReport – shown below. The 229-foot-tall (70-meter) SpaceX Falcon 9 had been slated for an overnight blastoff on Saturday, September 3 at 3 a.m. from pad 40 with the 6 ton AMOS-6 telecommunications satellite valued at some $200 million. The AMOS-6 communications satellite was built by Israel Aerospace Industries for Space Communication Ltd. It was planned to provide communication services including direct satellite home internet for Africa, the Middle East and Europe. The Falcon 9 rocket and AMOS-6 satellite were swiftly consumed in a huge fireball and thunderous blasts accompanied by a vast plume of smoke rising from the wreckage that was visible for many miles around the Florida Space Coast. “Loss of Falcon vehicle today during propellant fill operation,” Musk tweeted several hours after the launch pad explosion. The explosion also caused extensive damage to the rockets transporter erector, or strongback, that holds the rocket in place until minutes before liftoff, and ground support equipment (GSE) around the pad – as seen in my new photos of the pad taken a week after the explosion. Dangling cables and gear such as pulley’s and more can clearly be seen to still be present as the strongback remains raised at pad 40. The strongback raises the rocket at the pad and also houses multiple umbilical line for electrical power, purge gases, computer communications and more. One of the four lightning masts is also visibly burnt and blackened – much like what occurred after the catastrophic Orbital ATK Antares rocket exploded moments after liftoff from a NASA Wallops launch pad on Oct 28, 2014 and witnessed by this author. Black soot also appears to cover some area of the pads ground support equipment in the new photos. So it’s very likely that repairs to and re-certification of pad 40 will take at least several months. The last successful SpaceX Falcon 9 launch from pad 40 took place on Aug. 14 with the JCSAT 16 Japanese telecom satellite. The first stage from the JCSAT 16 launch was concurrently recovered with an amazing propulsive soft landing on the OCISLY droneship platform at sea. And Shotwell pointed to the numerous successful SpaceX launches in her conference remarks. “So now let’s look to the good. We did have an extraordinary launch year. We launched 9 times in just under 8 months, in the past year successfully,” Shotwell elaborated. Indeed, just 2 days before the launch pad explosion, SpaceX signed the first contract ever to utilize one of their recycled and ‘flight-proven rockets to launch the SES-10 telecom satellite for Luxembourg based SES. SpaceX has a huge manifest of contracted missions and is backlogged with approximately 70 launches worth over $10 billion. 3) they plan to use another pad besides 40 or 39A to do the next launch. If any of this isn’t true it’s ~6 months for even a simple fix to be implemented & for the company to get Falcon 9 re-certified for flight… and that clock hasn’t even STARTED ticking if they still don’t know what went wrong. Unless there’s something they’re just not telling us (Ken?) I’m thinking President Shotwell will begin walking his statements back fairly shortly, but that’s just me. @BCstargazer, that matches what I was thinking as well: the pad might be free, but can they launch to their desired orbits from there…? I’d love to hear Dr. Kremer’s further thoughts/insights on this. The rocket blew into a bozillion bits, but the fuel and LOX can only flare like that if they are atomized and well mixed, and there was a source of ignition. A large release of LOX would have caused a huge white cloud like you see coming from the rocket oxygen vents. We didn’t see that so there was no leak. There was a highly energetic breach of both LOX and RP1 tanks simultaneously and that requires an explosive, so either the launch range safety squib went off prematurely or there was a bomb stowed on board or it was hit by an RPG. In any of those scenarios the fix is easy and return to flight swift. If it’s an RPG, then A) they have to KNOW it was an RPG, and then B) they have to determine if there’s anything procedural that can be fixed to prevent someone with that type of short-range weapon from getting close enough to the rocket to fire at it, or counter measures to counteract such a device (they exist). Do you see how that leads to several months worth of delay, even though nothing to do with SpaceX was actually at fault? It only gets worse for the other two: if the squib lit off, then that’s a systems failure that needs to be taken apart down to the last component to figure out whether it was a materials, manufacturing, assembly, or control systems issue (or some combination thereof), which could take months-into-year(s) to determine and then implement; if it was a deliberately planted bomb, then suddenly every part of the process from drawing board to pad needs re-examination from a security management standpoint — a process that could take a number of YEARS. And again: all of this hinges on SpaceX already knowing in some detail what it was that went wrong. I concede most of your points, but the time to fix seems way off to me. Plus if any of the majority of these turns out to be true the whole industry will stop dead in its tracks to revamp security. Especially security from a bad guy with a 300 dollar drone. I think they already know the cause and are just redundantly going over every other option until they can announce the findings. It would be easier to speculate on much of this if the public knew who makes and installs and tests the range safety squibs. We know the Air Force controls them, but do they also own them? Are they purchased from a vendor? Is the hardware control circuitry the same as they used in the 1950’s or is it computer controlled with modern Linux based software, is it hack-able, is the range safety requirements such that each rocket supplier is allowed to build their own or some vendor approved by the Air Force? I know that I have the ability to completely build a viable secure remote control explosive device from scratch in a day or two and to test it to a fault within a couple of weeks at most. I have to think SpaceX,is at least as capable as I am. The idea that you, or I, or most anybody else have the ability to buy a 300 dollar drone, pack it with a KG of even home-brew acetone/peroxide explosive and fly it in undetected like any other pelican or gull to a launch facility and do significant damage is a frightening thought. Most frightening. Yeah, as I understand the general situation, they can’t do anything without solving the problem and getting upgraded/retrofitted rockets (or new fueling procedures, whatever) certified for flight. Question! Does anybody know if 2nd stage Falcon9 is fueled for the hold-down hot fire test, and if so why? Yes, you can actually watch the tanks filling by the frost line on the outside. You can also see the vents blowing the boiloff vapor. No Lox, no venting. It is probably not required, but the idea is to have a dress rehearsal for the launch at full weight. The rocket would abort during the countdown if it sees that there is inadequate fuel or inadequate pressure in either stage. The last in-flight launch failure was believed to have been caused by a faulty strut holding the second stage LOX tank. Am wondering if there is any connection to that failure? Could “the fix” have created further complications? I imagine certain strengthenings were effected. Also SpaceX is now using an ‘enrichment’ or densification process with the LOX… THOSE mechanisms should be high on the list of things to double check. In my experience working on vehicles I’ve found it best to check the last thing done, first! You have a point, the last issue happened at almost the same point in the airframe. If this is a range safely squib prematurely going off, or worse yet going off because somebody hacked them it is going to be interesting. One thing that surprises me is that the first stage exploded all at once – that’s the shockwave that shook the camera and had the loudest crack. The fuels are in separate tanks – how could they ignite together, completely like that? (it’s not a solid fuel stage, correct?) The tanks would had to have been ripped open, which it does not appear that the initial explosion did that – it would have exploded almost immediately, I would think. Well, the fireball could have set off the squib charges…that could do the trick…and it happened very shortly after the fireball reached the ground, completely surrounding the rocket. It might be instructive to slide the audio track up to match the video. A 12 second delay (due to being over 2 miles away) is hard for the brain to connect the sounds with what is seen.